There are many interesting facts about Alpacas that are not common knowledge. Alpacas were domesticated over 6,000 years ago, and their fleece was used to signify the elite and nobility. Alpacas are of the Camelidae family, meaning that they are related to llamas, guanacos, vicunas, and both the Bactrain and Dromedary camels from Asia and Africa. Back in 1984 a small group of importers brought the first herd of alpacas to the US and Canada, where they have been living ever since. The herd has grown from a couple of alpacas to 20,000! The fiber of an alpaca comes in sixteen different tones that can be identified by the textile industry. These colors range from light grey to dark fawn (tan). There are two different types of alpacas, Suri and huacaya. The Suri fiber grows out long and creates silky dreadlocks. The huacaya has dense, crimped fleece that resembles a teddy bear. 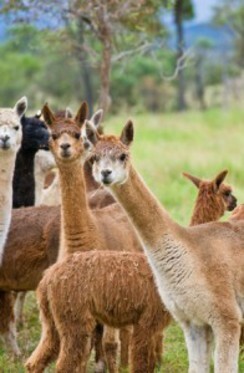 90% of all alpacas in North America are huacayas. Llamas and alpacas can successfully breed with each other. Their offspring are called huarizo, which are especially valued because of their long fleece. 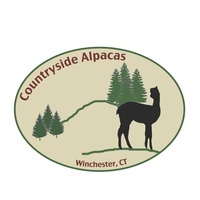 Alpacas when they need to go to the bathroom use what is called a “communal dung pile” away from where they graze. So, based on this, alpacas could theoretically be house-trained. Alpacas make many different noises. The most common of these noises is humming, which almost sounds like purring. They hum whenever they are bored, fearful, content, worried, distressed or cautious. When an alpaca is startled, one animal will make a staccato braying sound, and then the rest of the herd will join in.